After releasing impressive drilling results from the company’s Mt York gold lithium project in the Pilbara region of Western Australia just last week, Kairos Minerals (ASX: KAI) brought overseas investors up-to-date with the group’s story at the 121 Mining Conference in New York. One of KAI’s key attractions, particularly as a junior explorer is its dual asset status. 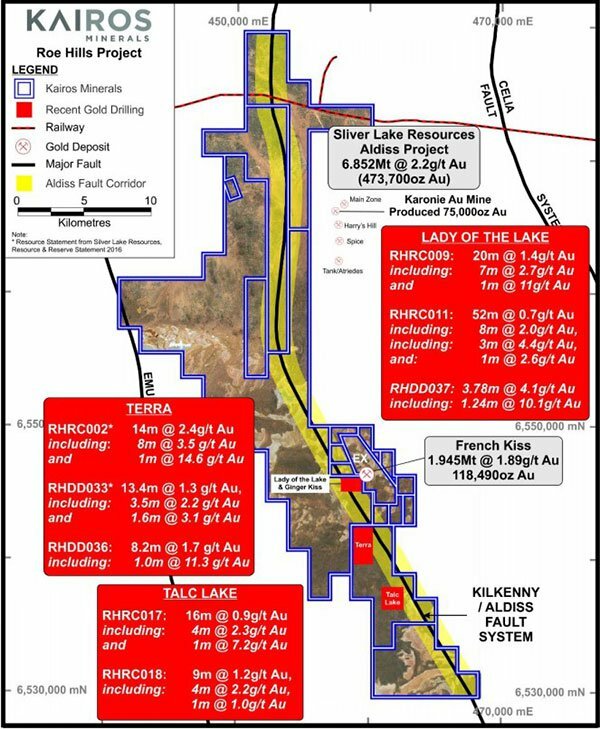 The company has the promising Roe Hills gold project situated in a highly prospective area 120 kilometres East of Kalgoorlie. The company’s landholding of more than 300 square kilometres adjoins prominent projects being operated by Breaker Resources (ASX: BRB) and Silver Lake Resources (ASX: SLR). The former released further promising high grade drilling results last week which should see it continue to upgrade the mining potential of the 2.2 kilometre long Bombora gold discovery. This resulted in the company’s shares spiking 10% to a new 12 month high. However, it should be noted that share trading patterns should not be used as the basis for an investment as they may or may not be replicated. Those considering this stock should seek independent financial advice. KAI has recorded impressive results from Phase 1 reconnaissance drilling, confirming significant gold mineralisation at all three key prospect areas tested at Roe Hills. Details of the results are listed below. Management noted that drilling indicates the potential for Roe Hills to host significant gold mineralisation along a largely untested prospective strike length of more than 40 kilometres. 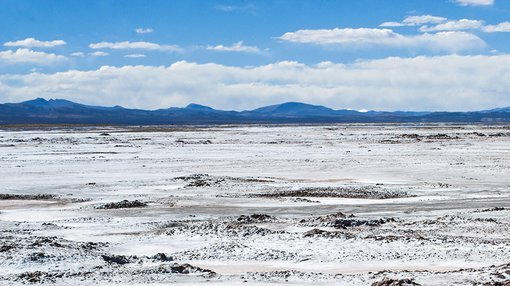 KAI also views Roe Hills as a potential cobalt opportunity. A review of historical data has revealed near surface cobalt mineralisation at the ROE 1 prospect with anomalous cobalt identified over a total strike distance of circa 7.5 kilometres. In tandem with Roe Hills, KAI is progressing the Mt York gold and lithium project. In October 2016, KAI delivered an upgraded Indicated and Inferred Resource for the Main Hill and Breccia Hill deposits at the Mt York project. This resulted in a near doubling of the resource to just over 250,000 ounces with all deposits remaining open along strike and at depth within well-defined mineralised zones, providing rapid resource expansion opportunities. Management announced last week that all final assay results from a maiden gold focused drilling program had been received. These included robust grades and relatively wide intersections. Preparations are underway for the next phase of exploration at the project which will include further investigation of new priority targets. 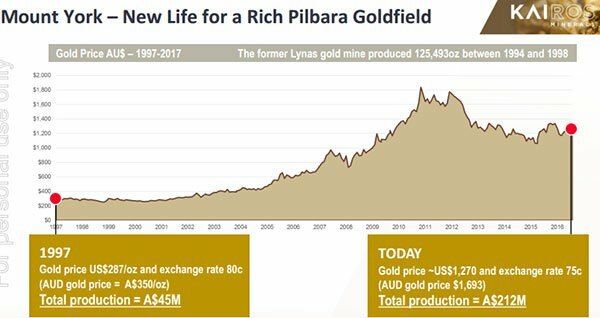 What makes KAI’s Mt York project an interesting prospect is its proven performance when operated as the Lynas gold mine. As indicated below, the conditions are far more favourable today in terms of the economic viability of the project, and there appears to be the potential to produce far more ore than was the case between 1994 and 1998.